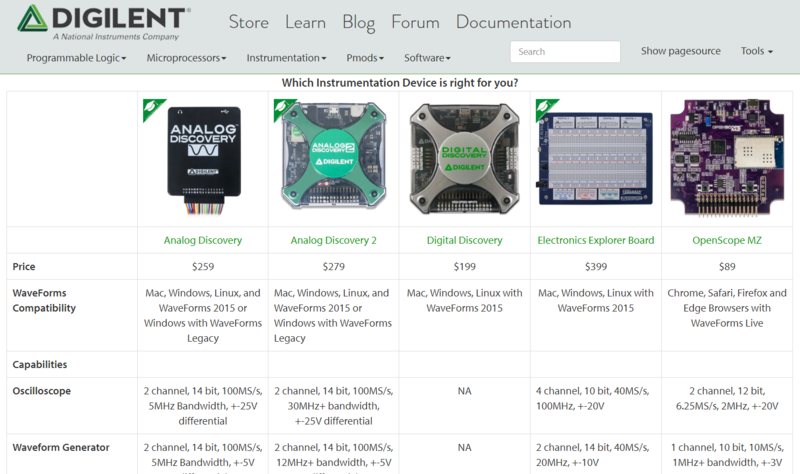 Which Instrumentation Device is Right for Your Classroom? Something we talk about pretty often is that although Digilent’s portable instrumentation devices are commonly used in professional environments, originally these tools were created for education. Our founders wanted a way to let every single student see the signals in their systems anytime they needed, while not necessarily being confined to the lab. This way students could learn on their schedule and accelerate discovery. This also helped supplement the time needed in the dedicated lab, while strengthening the practical knowledge base of students through hands-on experimentation. While remaining dedicated to education, we’ve also spent over 10 years adding functionality and growing our instrumentation software toolset, WaveForms, so that it is more applicable to the professional user. In the last few years, we’ve continued this effort by introducing the WaveForms Live software, as well as mirrored this effort in hardware by introducing the Digital Discovery, a whole variety of adapters, and the OpenScope MZ. This can leave academics potentially confused. So today I’ll go through which hardware is right for which classroom. Throughout Analog Circuits courses, students will need a variety of tools and many of them can be found on the Analog Discovery. The most frequently used will likely be the Oscilloscope tool to view the outputs of the circuits and components that they’ll be learning about. Additionally, they’ll need a waveform generator to provide input to these circuits. Although the Analog Discovery’s primary mode of connection is the Flywires, with the addition of the BNC Adapter, traditional probes can be used and the bandwidth of the scope is increased to 30MHz. 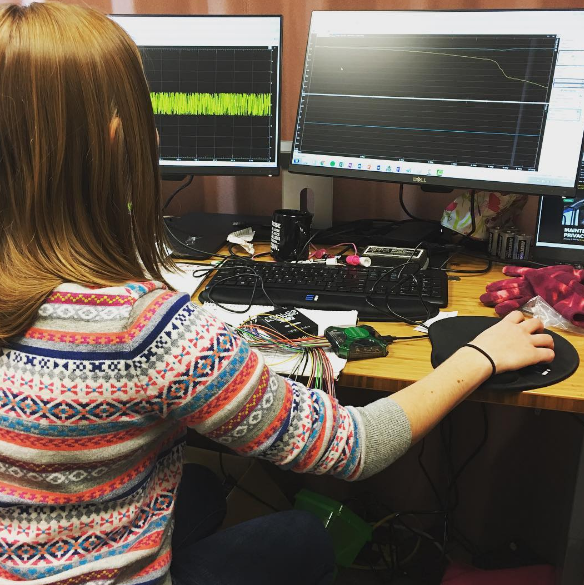 When students move on to designing filters, the traditional method of obtaining the frequency and amplitude response can be used to demonstrate the process. In addition, the Network Analyzer provides the ability to sweep the frequency range and automatically plot these responses, which significantly decreases iteration time. The Analog Discovery 2 also provides a basic power supply and voltmeter, for when -5V to +5V power and simple voltage measurements are needed. 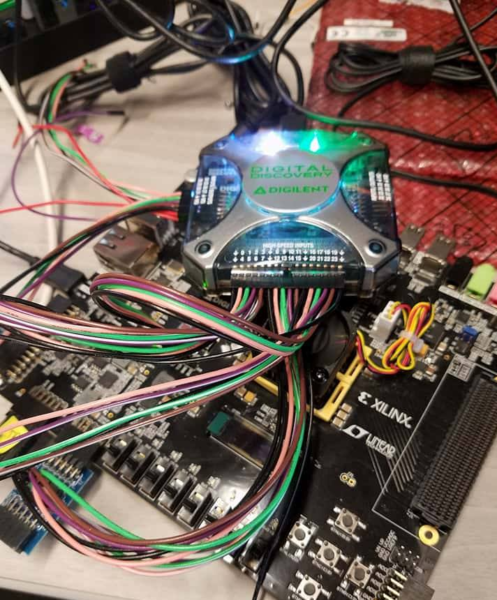 During a student’s time in an FPGA design course, they will learn theory, design and analysis methodologies, and apply this knowledge to a variety of FPGA designs. Naturally, part of this process includes failure and iteration. So students can simulate their designs, however, even then there will be timing and other factors that won’t be seen in simulation. 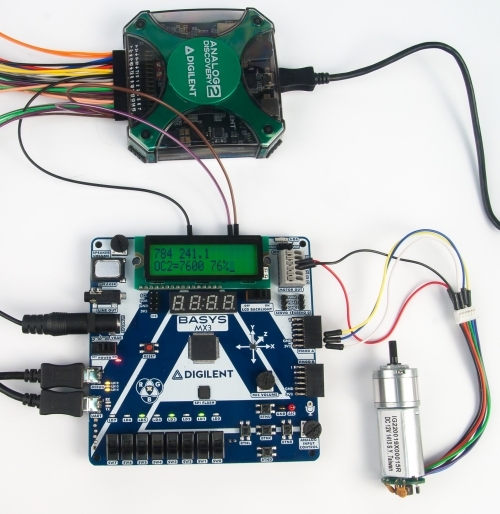 The Digital Discovery provides a Protocol Analyzer, Logic Analyzer, and Pattern Generator in one tool gives students the opportunity to view the signals in their designs at any point in the design process, not just through simulation. Seeing the signals, and viewing the decoded data, creates the opportunity to decrease the unnecessary barriers to understanding the problem and decrease time spent iterating on the design. The Digital Discovery also provides sample rates of up to 800 MS/s, up to 32 Channels, and selectable logic level, making it a more versatile Digital Design tool than the same instruments on the Analog Discovery. For the same reasons that the Digital Discovery is the right choice for FPGA Design and Embedded Development, it is a great choice for a System on Chip course. 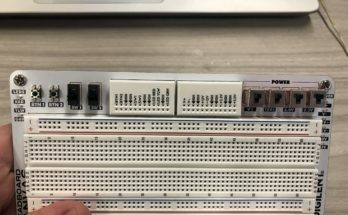 Giving students the opportunity to see the signals in their design and connect the code to the actual behavior provides a deeper understanding of the concepts and design. Both the Analog Discovery and Digital Discovery are good candidates for this course. Both incorporate the Logic Analyzer, which provides the opportunity for students to see and analyze display timing, protocols, and motor signals. 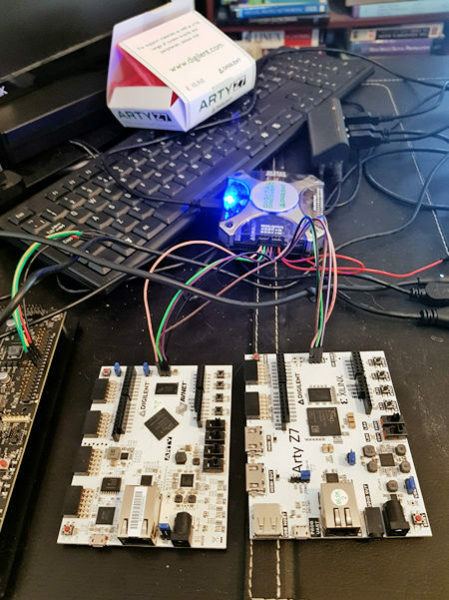 In addition, they both have a Protocol Analyzer for simulating UART, I2C, SPI and CAN signals, plus a Pattern Generator for generating a known input. The choice between the two depends on a number of factors. Does the course also require analog instruments, which are available on the Analog Discovery? Or does the course require a higher sample rate than 100MS/s, which the Analog Discovery can provide? If leaning toward the Digital Discovery, make sure to check if the course requires selectable logic levels and other settings found on the Digital Discovery when making your decision. Additionally, one must take into consideration if the course requires more channels than the 32 found on the Digital Discovery. Check out this course material to view some example embedded systems labs using the Analog Discovery. The Oscilloscope on the Analog Discovery can be used in electromagnetics to demonstrate some of the more difficult concepts. 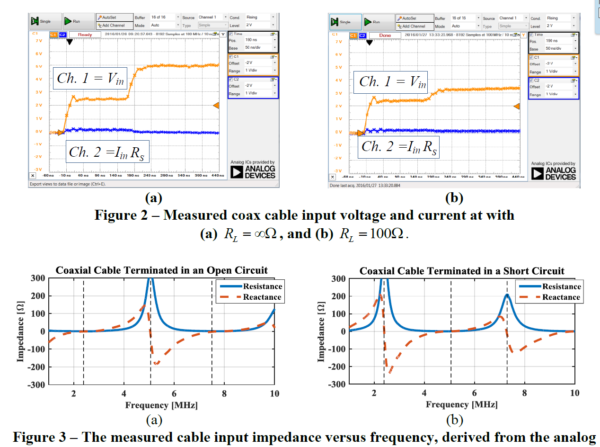 For example, the cable time delay of a coaxial cable in relation to cable length and changes in reflected wave amplitudes can be explored. In addition, the Network Analyzer can be used to explore other concepts that have frequency dependencies. 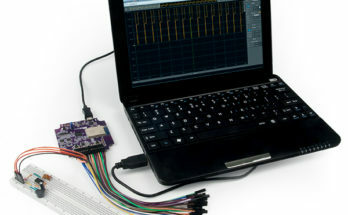 The Analog Discovery’s Network Analyzer tool can be useful in exploring the magnitude and phase responses of various Digital Signal Processing circuits. 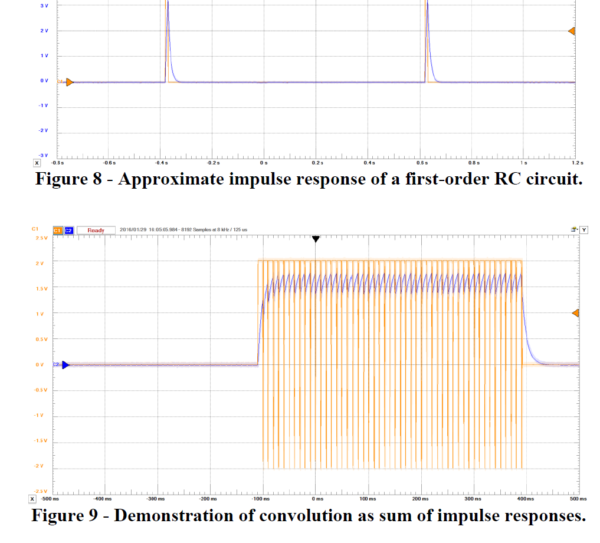 The Analog Discovery’s Oscilloscope and WaveForm Generator tools can be used to analyze an approximated impulse response, as well as the step response of a system, and demonstrate convolution. The Spectrum Analyzer on the Analog Discovery can be used to visualize the spectrum of various periodic signals in order to compare expected results based on computation. The WaveForm Generator on the Analog Discovery can be used to generate frequency and amplitude modulated signals, providing the opportunity to visualize how the message signal affects the carrier wave. In addition, the Spectrum analyzer can be used to further analyze the signal, and demonstrate its component frequencies. The WaveForm Generator on the Analog Discovery can be used to supply known inputs to the control system in order to test its design. In addition, the Network Analyzer provides a quick way to view the frequency response (transfer functions) for characterization and comparison to theoretical models. Overall, the Analog Discovery can also be used in many additional upper-division courses. To read more about its use in these courses, check out this paper presented at ASEE. As discussed above, each device in Digilent’s portable instrumentation line contains a number of tools that provide the functionality of its benchtop counterpart. In total, the Analog Discovery provides 13 instruments and the Digital Discovery provides 5 digital instruments at higher specifications. This makes them great devices for student-owned instrumentation, as well as flipped classrooms and remote learning.This can effectively increase the availability of classroom spots to students, and remove unnecessary situational barriers to learning. You can read more about the success of the flipped classroom model here, and learn more about the remote labs in this paper presented at ASEE. If you have any additional questions or comments about which instrumentation is right for which classroom or want to share your use of Instrumentation, we encourage you to comment below. Previous Article Need IoT? Check out the Pmod ESP32 !